It’s likely a unanimous opinion that those traveling from one place to another via airplane want their journeys to go over as seamlessly as possible – especially where the part about actually being 30,000 feet in the air is concerned. Part of helping a trip by plane feel that way (in spite of the imminent gate changes, boarding delays, and the occasional traffic on the tarmac), often comes from emotional easement by way of things like in-flight movies and-or listening to music. 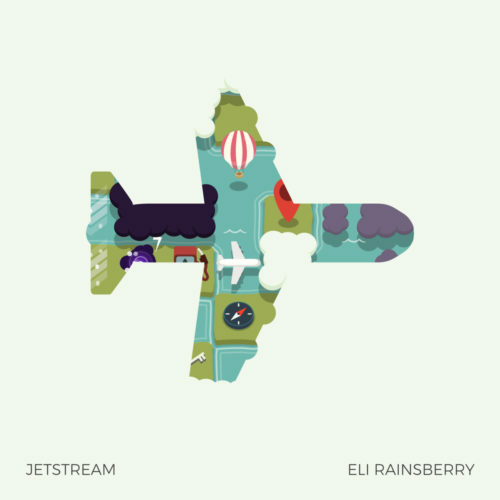 Though composer and self-described “noise person,” Eli Rainsberry, didn’t write music explicitly for the purpose of being listened to on a flight, and though the album they composed is actually for Jetstream, a newly launched game on the Steam platform, one could easily argue that this soundtrack is perfectly suited for a long flight; its gentle and warming melodies helping to make the many stationary hours go by that much quicker. Just released this week on Steam and Bandcamp respectively, even if one listens to Jetstream’s soundtrack before exploring any pieces of its visual and interactive counterpart, the heavily encouraged moods the album’s 11 tracks inspire are that of a carefree or almost trance-like calm. The sonic variety across the record is minimal. Rainsberry, who composed and produced the entire work themselves, sticks with a toolkit of mildly reverb-coated, soft-edged synth tones that never venture so high in pitch as to jar with notes that bounce off the ear with abrasive pings or buzzes, nor so low as to risk forming a mental association of descent in sound and descent in imagery, which in this case would be the small plane players are guiding through puzzles in the game. Interestingly, the closest application of Rainsberry’s synth of choice that comes to mind is also used within a game-supportive context: The theme for “Aquaman” from Capcom’s Megaman 8, composed by Shusaku Uchiyama, evokes a similarly smooth, relaxing, and melodically undeterred vibe that matches its underwater level setting and functions in a manner similar to Rainsberry’s soundtrack. In addition to the synth tones, subtle inclusion of tone-driven percussion from things like glockenspiel on “Layover” and xylophone on “Flight Plan,” introduce moments of melodic deviation, without disturbing Rainsberry’s well-established atmosphere of seamless sound and even-keeled instrumental structure. There’s enough difference to notice it for a flash but enough similarity to easily maintain the pleasant listening experience being provided throughout. These decisions on Rainsberry’s part might seem simple but their refinement can’t be understated when taking into account that the music in a puzzle-based game like Jetstream is intended to be supportive rather than leading. GIF courtesy of Clockwork Acorn. Furthermore, Rainsberry’s ability to closely mirror the intermittently exciting but ideally uniform event of a flight with their injection of sounds that are enjoyably notable but not detracting – much the same way getting to fly through a cloud can add slightly more thrill to a flight for some, without causing an abrupt shift in overall passenger mood – shows that they were mindful of the multi-faceted potential this soundtrack would have once intertwined with the full game experience. Even the conceivable climax track, “Turbulence” – where one would presume the highest chance of sounds, rhythms, and chords meant to spontaneously disturb – keeps the Jetsream OST at its carefully earned melodic high. Aside from mildly nimbler synth motifs that appear in short bursts no less intimidating than short gusts of snowflakes during an unexpected winter squall, the anticipated moment of distress is kept well under control, as one would hope for in both real life and during a more difficult portion of a video game. The music of Jetstream’s OST doesn’t stray from its auxiliary post but it also manages to provide just enough of an intensifying effect to encourage an immersive venture. And even for something as straightforward as steering a plane in the puzzle genre, it’s always a goal for game creators, developers, and score composers to make something together that can turn into a fun escape, no matter how brief it may be. The Jetstream OST is available now on Bandcamp. Jetstream is available now on Steam, for Mac, PC, and Linux. The game will be coming to mobile for Android and iOS later in 2019. The soundtrack and game are also available for bundle purchase through Stream.